We recently discovered this couplet from Wikipedia about mì Quảng. It describes a girl from the city of Quảng Nam, in Vietnam’s south central coast, who invites her lover to a cup of green tea and makes him mì Quảng to show the depths of her affection for him. Honest to goodness, this was actually the first dish I ever made for Hong. He’s originally from mien bac (north) and I’m from mien nam (southern) of Vietnam but we both LOOOVE the food from mien trung (central) such as mì Quảng. It is one of our favorite soups during the spring and summer months when it’s too hot to enjoy a bowl of pho or bun bo hue. This noodle dish is a complex mixture of flavors and texture. The vibrant wide yellow tumeric noodles, sesame rice crackers, roasted peanuts, fresh herbs, and flavorful but light broth sets mì Quảng apart from other Vietnamese noodle soups like pho and bun bo hue. Unlike these noodle soups, mì Quảng is served with very little broth and almost like a dry noodle dish or noodle salad with the broth serving to bring all the flavors together. This dish has multiple steps but is WELL worth it. It’s something that can be done to eat for the weekend (make broth friday, make the rest and eat saturday) andinvite friends over. Recipe serves about 4-6. Start first with the broth. Like most Vietnamese broths, it’s a two step process. First you boil off the gunk in the bones and clean it and then with the cleaned bones you make the broth. In large stockpot place bones and enough water to cover the bones. Bring water to boil then pour over a colander, discarding the water and gunk. Clean the bones under running water and clean the pot (or have another pot with boiling water ready to go). Place bones back into the pot and add shallots and dried shrimp and fill with water to cover and simmer for about 2 hrs. Remove bones and season broth with salt and touch of sugar. If you’re using spareribs, leave them in and serve as well. 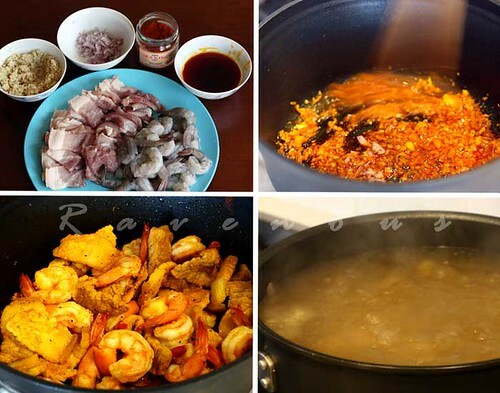 Annato seed oil imparts a beautiful red/orange color to the meat and shrimp. To make annato seed oil, heat 1/8 cup of olive or vegetable oil in large wok or saute pan and add about 2 tbs of annato seeds. As the temperature rises, the red color will seep out of the annato seeds. Strain and discard seeds. Using prepared oil, saute garlic, shallots, paprika and pork. Half way through, add shrimp as this takes less time to cook. Season with salt and pepper to taste. Set aside, covered. To save time you can buy it already made which uses food coloring. However, it’s really simple to do it yourself. Bring a medium sized pot of water to boil, add wide pho noodles, after about 3-4 minutes, add oil and tumeric powder, and stir. If too pale, add more tumeric to desired color. The tumeric doesn’t add that much flavor to the noodles and is more a visual thing. Noodles are done when you can easily bite a strand without it being too firm or mushy. Drain and set aside. *Banana blossom is a common accompaniment. If not available, it won’t make or break the dish. Cut banana blossom lengthwise, peel purple leaves keep the purple leaves. Discard the small flowers in between the leaves. Stack and roll leaves together and chiffonade. Immediately place in bowl of water with about juice of 1 lemon to prevent from discoloration. *Sesame crackers can be found pre-cooked in asian markets. Uncooked ones are also available and it can be microwaved for about 2:30-3 minutes (depending on wattage) until it’s crispy. In bowl, add noodles and the sauteed pork and shrimp. Then add the broth (to keep with tradition use little broth, abut 1/4-1/2 of the bowl). Add bean sprouts, mint, perilla leaves, banana blossom, cilantro, and green scallions. Top with toasted peanuts and black sesame rice crackers and enjoy. The finished product looks fantastic! Mi quang really is a very special Viet noodle dish. It’s aesthetically gorgeous and so, so delicious! What a beautiful dish! And I love the story to go with it! This is a great blog, wonderful recipes, and beautiful photography. Who could ask for more…well, except for a bowl of this soup? A good bowl of Mi Quang is hard to find anywhere, in Vietnam or U.S. It's a funny dish that I can never quite decide on — is it a noodle soup or wet noodles? Thanks for putting together a nicely detailed recipe. Wow, i really love your blog and will be returning often. Thanks for visiting mine. I like stir-fried noodles…..with lots of seafood and shredded vegetables. Tumeric Flavored Noodles sounds classic. sharon: Thanks again for the kind comments. 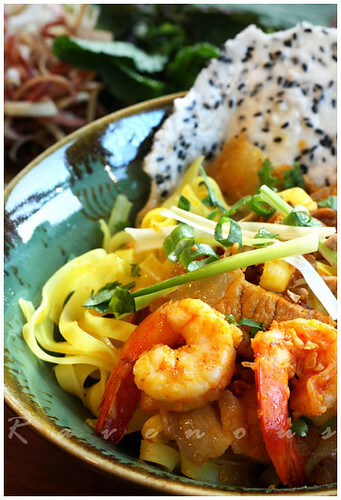 We love sharing Vietnamese cuisine for everyone to try. Gastronomer: Thanks, we served it to some friends and family that never had it before…and they loved it too. Christoofat: Thank you so much for those compliments. Hopefully there's a place in your neck of the woods that serves this. Andrea: Thanks for stopping by our site. We totally agree about it's nebulous nature…we actually had thinly sliced pinapple and mango as a garnish to increase the noodle salad nature of the dish, but felt it was too unorthodox to post….but definitely not to eat! Shavedicesundays: Thanks! 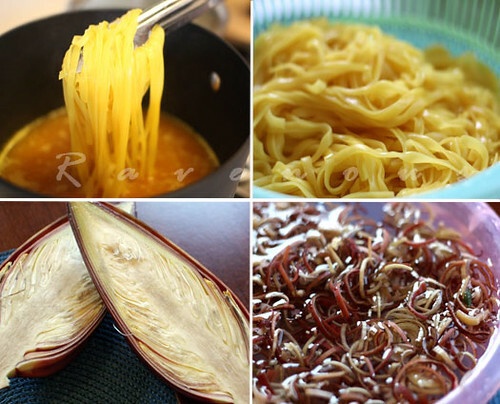 Great rau muong recipe! We'll visit your site often. Angie: It is definitely a Vietnamese classic, but not well known among non-vietnamese. But we hope we're changing that. These are some killer photos! I haven't had banana blossom and now I am very curious. It looks sooooo good! I will have to try your recipe next week! You are quite a food photographer! WOW thank you for this! I've been looking all over for a mi quang recipe ever since I read it about it last year. And finally…I can try making this at home. Thank you again! Btw, I'm so excited that I stumbled upon your website (via flickr, which I added you as a contact) -keep up all the good work You have some really fab food photography (and recipes). jessica: banana blosson is really interesting.just remember to avoid oxidation by putting it in water w/ some salt immediately. ddhac: let us know if it turns out. we'll love to have a photo! jenny: Thank you so much for the add and please let us know how this turns out. We'll also love to have a photo of it. Darlene: I actually ate mi quang in VN – The best noodle I had was the one that made out of brown rice, so the color of the noodles is actually brownish pink rather than yellow. The noodles were thicker than "banh pho". I would say the thickness of the noodles is almost like the thickness of the linguine… The picture in this photo looks so delicious! I have to make mi quang for the 4th of July weekend! Thanks for this wonderful recipe and a bit of history. I never understood what is so special about Mi Quang since the noodle shops in VA serve this dish like any other seafood egg noodle with stir-fired pork, and a piece of shrimp toast. for the longest time I thought Mi Quang is Vietnamese way of calling Chinese noodle. Erin: You're welcome…as Andrea Nguyen mentioned above, it's hard to find authentic Mi Quang, but we try to be as close as possible. Mi Quang is my hand's down favorite soup/noodle dish in Vietnam. My girlfriend and I visited 'mien trung' last week and sampled all varieties of this lovely dish. You can actually find (in my opinion) just as tasty bowls of mi quang down south in HCM if you give it enough of a look. 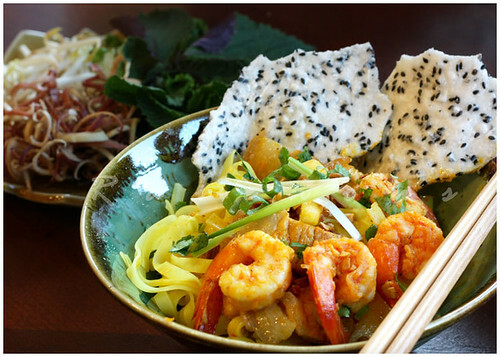 The peanuts, banana flowers and rice crackers take these noodles to the next level. Great work cooking up some. A. Rizzi: While there are alot of regional specialties in Vietnam, HCM's versions are often times better because there's just more resources, and ingredients there then in the more rural parts of the country. Have fun in your travels and keep on blogging! Mi Quang is pretty much like gumbo, a poor man dish that has many faces. It all depends on what people have in the kitchen. Similar to Bun Bo Hue, you can add a pineapple to the broth soup to get more flavor. Nguoi Trung )middle region people did this a lots. You can also add chicken feet to it and baby ribs, too. Finally, the dish needs "kinh gioi", a herb that nguoi trung also loves to use here. It can be served with hard boiled egg. funfoodcook: We agree w/ you…sometimes we put pineapple and even mango into the soup. We do use pineapple for making bun bo hue, but haven't tried with this…no reason why it wouldn't taste good! We love kinh gioi, Vietnamese balm, and use it whenever we can. Lovely recipe! It sounds like there is definitely room for variations on Mi Quang, but I like the way yours looks the best. front studio: Thank you! There's definitely room for interpretation for mi quang so we're always willing to try something new! So…for now, I'm just admiring the photos and imagining the taste. What I'm looking for is a recipe to make the noodles from scratch. Sauteeing pho noodles with tumeric sounds downright sacriligeous to me. My first mi quang was a vegetarian version at a little shop in Phu Nhuan (now gone I'm afraid). Ever since I've been a huge fan. It used to be pretty rare to find mi quang in Saigon, but in the last few years there has been a huge surge in its' popularity, including the opening of the first mi quang restaurant chain. My favorite mi quang is found in the Bau Cat neighorhood in Tan Binh district. anon: look for them with the rice spring roll wrappers..it's called banh da or banh trang me..good luck!! Wow.I just found your site. I am a Viet guy who has never ever been in the kitchen. Now that I living alone, far from family, your site has brought life to my kitchen. Now, whenever I miss the taste of home, I can find it at home. Great photos. Great directions. So great I am starting to feel comfortable in the kitchen. Mi Quang is delicious and can be found everywhere in Hoi An. I also like Hoi An specialty – Cao Lau. Great recipe! I've made it for the first time! Look how it turned out!!! http://img574.imageshack.us/i/dsc04547q.jpg/ Thank you! 2. I was told to add a whole squeezed lime or lemon to the water where you shread the banana blossom into. Keeps the shreaded banana blossom in this acidic water until near serving time. It keeps the vegetable looks cleaner and more attractive. I also discard several outer layer of the banana blossom. H&K, I'm only seeing this recipe for the first time. I totally thought those noodles were just dried yelllow noodles. But the turmeric/oil dipping is very genius. This looks awesome and it's one of my favorite soup noodles after BBH. I posted the previous comment under my other login, sorry. i also live the version of mi quang kho. this dish is delicious! Thanks for the recipe and the photos!! I added in some fresh tomatoes to my pork/shrimp pot at the end. This reminds me of another noodles dish I am dying to re-create/learn more about. Cau Lau. I ate it in Hoi An and I am so curious about making it. Some people say that the noodles are made of rice flour, others wheat. It certainly does have a texture unlikely any other. Do you guys know anything about cau lau? Thanks, Katie. We’ve only heard about cau lau and never had it–some say it’s unique because of the water in the region of hoi an. I really enjoy your website and articles. The correct spelling of “nghệ” in English is “turmeric”, not “tumeric”. (You missed letter “r” between “u” and “m”. Thanks and best wishes to your family! I had this dish at Bambino in Springfield MO. It was fantastic. Thanks for the recipe. I fell in love with this dish living in VN but the wife is an HN girl so she doesn’t know how to make this one. I can cook well so I’ll give it a try . . . I am a fan now. Thank you! I’m a horrible cook but I’m usually able to follow your recipes and they’ve always turned out great! Could you be more specific about the amount of sugar and salt to add roughly? we always encourage seasoning as you go, start small and build up to taste. that way after cooking a few times you’ll develop an inherent sense of how much to season. I’ve tried so many different recipes but yours is hands down the BEST! I made 3 failed attempts at making the turmeric noodles (because turmeric has such a strong and distinct flavor which my family found overwhelming, so we’ve just stuck with normal egg noodles instead. This has become my special occasion signature dish amongst my friends and family. Reason being is it takes me almost 16hrs to make enough for 20 people. I also take extra time and care to make (my own modified version of the broth) pork and chicken broth then cooking the broth as per your recipe but plus 2 hrs of simmering to further reduce and amplify the flavors of the broth. In comparison to other recipeso yours the best. Thanks . Traditionally, the noodles were made with alkaline water. The high pH changed the color of the noodles to yellow. These days, most manufacturers use turmeric as a coloring agent.